Agios Prokopios Naxos This long stretch of golden sand on Naxos' west coast stretches for miles and is popular with families, backpackers and naturists alike. But due to its size, there's more than enough room for everyone. Starting at Agios Prokopios, the beach stretches south to Agia Anna and becomes Plaka beach further down the coast. At Agios Prokopios and Agia Anna there are tavernas and shops lining the beach and tourist facilities available, while further afield the beach becomes more remote with fewer facilities. The sea is clear and the beach shelves gently into the sea, making it ideal for kids. Agios Prokopios itself is a laid-back beach resort with a few tavernas, bars and shops and a number of hotels and apartments. 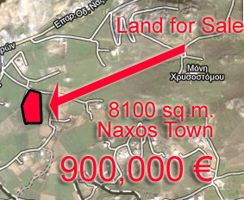 It lies 6km from the island's capital, Naxos Town. For the holidaymakers who can drag themselves away from the glorious beaches, Naxos provides a wealth of ancient Greek remains as well as plenty of Byzantine and Venetian history. The island's capital, also called Naxos, has a Venetian fortress as well as an ancient Greek temple to Apollo. With such romantic charm and mystique, it is little wonder that Naxos has long been popular with writers and artists. Lord Byron visited in his youth and never forgot the experience, referring to it in his writings as the a"Dream Islanda" and often saying that he would love to return some day. Naxos Island has 41 villages and most are worth exploring. They are found in the green fertile, valleys that are sandwiched between the rugged, arid mountains. Many of these are over 2000 feet high and the highest, Mount Zeus is 3,200 feet. 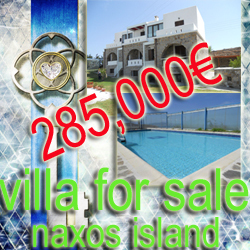 Naxos Island enjoys the economic rewards of being a tourist island but it does not depend on them for its prosperity. A great deal of farming takes place in its rich valleys and the cultivation of lemons is especially successful. In addition to lemons, Naxos produces cherries, pomegranates and other fresh fruit. It also produces olives, nuts and potatoes whilst its grapes make some of the best of Greek wines. Local Cuisine Local Products Naxos Island Greece produces a wide variety of products. The most popular souvenir is a bottle of citron liqueur, which is made from citron leaves. Other Naxos products include hand-made woven fabrics, pottery, hand-made leather goods and jewelry, specially the "Naxos Eye", which is said to bring luck. Available doctors at the hospital: pathologists, general, pediatrist, orthopedic, gynecologist, cardiologist, microbiologist, dentist, doctor for diabetics, for radiographies and surgeon. There are also four rural doctors and twelve nurses. The Health Centre has a microbiological and a radiant laboratory and two ambulances. In each of the following periphery centers works a rural doctor. The doctors of the hospital often visit these centers. Emergency Incidents: A helicopter of EKAV (Hellenic Centre of Immediate Need) carries all the emergency incidents to Athens or to Syros Island (if the weather conditions are not appropriate). 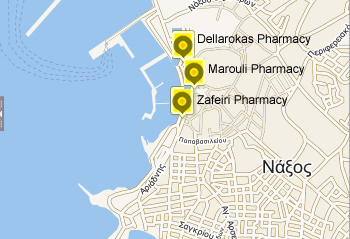 For a non-emergency incident, the patient is carried out to Syros island by ship. The west coast of Naxos Island , where Naxos Town and the beautiful beaches are located, is only the tip of the iceberg. Naxos Island is the largest of the Cyclades Islands and has a lot to offer in its mountainous interior as well. By far the best way to visit the interior of Naxos island is to rent a car. Then take a scenic loop beginning in Naxos Town and heading out southeast to Filoti, then northeast to Apirathos and Apollon, and finally head back to Naxos Town along the highway that follows the north coast. A spot of white in the turquoise waters of the Aegean Sea, Naxos Island is a unique blend of ancient ruins and beach culture. The largest of the Cycladic Islands, Naxos Island is the childhood home of none other than Zeus, king of the gods. Upon arrival in Naxos, hike over a causeway to Palatia, where the Portara, a stone gateway to an ancient temple that no longer exists, stands alone, the symbol of the island. At sunset, the views of Naxos island, and the sea beyond, are breathtaking. People gather every afternoon and relax gazing the sunset from Portara Naxos. Naxos Island is a popular tourist destination with several easily accessilble beaches. More than 98 kilometres of fine golden sandy beaches are surrounding the beautiful island with superb crystal - clear turquoise waters which are glimmering under the bright Mediteranean sun. Agios Prokopios, lying on a sheltered bay with a beautiful stretch of sand, and then Agia Anna Beach, Plaka Beach, Micri Vigla, Kastraki. On the eastern side of the island there is a road which follows the coast down from Moutouna to the south, passing the magnificent beach of Psili Amos, and ends up at Panormos on Naxos Island, a deserted beach with pine trees. Naxos Island Greece is such a versatile island that satisfies all types of tourists, from the sightseer and the nature lover to the party-goer and the laid back tourist. To get a taste of the island, we suggest taking a stroll in Naxos Town (Chora) through the winding alleyways to admire the whitewashed houses, with their potted flowers, and colourful doors and shutters. It is truly a calming and rejuvenating experience. When entering the harbour of Naxos Island you can see Portara, Naxos Island , the chapel of Our Lady Mirtidiotissa and the castle. Portara the big marble gate that stands high on the island of Bachus is waht the remains of the ancient temple of Apollo that was standing here. The ruins of the temple are called Palace, implying the palaces of Ligadmi the ancient tyrant of Naxos Island. The legend says that here Theseus abandoned Ariadne when he came back from Crete. Naxos town on Naxos Island possesses several of the island's most characteristic sites, such as the "Portara" (the marble gate to the ancient Temple of Apollo), the Venetian Castle, the Mycenean City in the Grotta area, the Archaeological Museum, the 16th century Bazeos Castle, and the Churches of Zoodochou Pigis and Panagia Myrtidiotissa. While touring Naxos Island, you can visit many other significant archaeological and historical sites. Apiranthos is one of the oldest settlements on the island, that has much in the way of interesting folklore to offer as well as some remarkable examples of tradtional architecture. In Apirathos, you should stop to admire the Zevgoli Tower and the Museums as well as the encahnting view of the sea. If you are an archaeology buff, then we recommend visiting the Kouroi in Apollonas and Flerio, the Ancient Site of Iria and the Sanctuary of Demetra and Apollo near on naxos island. Sagri. The Plain of Tragaia which stretches from Sagri to Agiassos has been called "Little Mystras" by Byzantine scholars becuase of the wealth of important Byzantine remains that have been found there. Many churches which not only contain valuable sculptures and wall paintings, but are of interest from an architectureal point of view, lie scattered around the area. 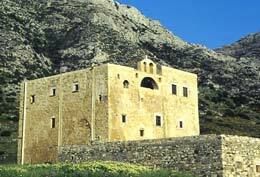 In a lonely area to he north of Panormos stand the Chimaros Tower, a round marble building dating from the Hellenistic period. 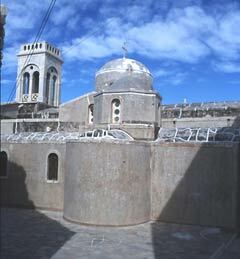 From the Venetian Era on Naxos Island , you can admire the Bellonia Tower in Galanado and the towers in Melanes. A splendid natural site is the Cave of Za in Filoti, where visitors can see a collection of impressive stalagmites just over the Zas Mountain on Naxos Island. Carnival is celebrated on Naxos Island. Come to Naxos and enjoy the ancient traditions and stories that revive. Sinaxia, a group of people who love the island and show it. The adaption of Dionysos from the Tirrenean pirates revives, Lampadiforia and Naxos Town Carnival give joy to all people who live on Naxos. Take a small taste of Naxos Carnival in 2012, as caught by Star Channel. Naxos, where tradition and old customs still survive until today. Star Channel (greek Tv station) visits Naxos and records moments of Naxos celebrating this years Carnival and the festivals taking place on Naxos villages. In Apiranthos the Carnival is celebrated with a tradition called "koudounatoi". It really worths visiting Apiranthos on this day to see this local custom reviving. 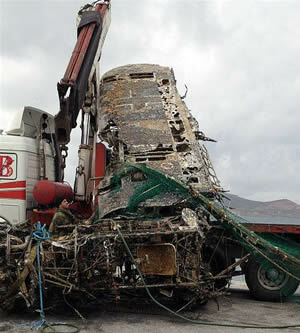 A German plane Arado Type was caught in fishing nets near Iraklia Island. The plane is said to be shot down after dense enemy fires by the British in September 13th in 1943. The British (Beaumberg) landed off Lemessos. 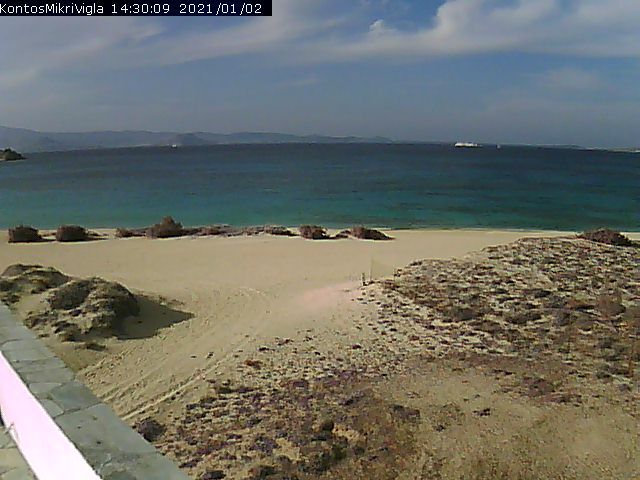 Naxos beaches where awarded with 3 BLUE FLAGS for the year 2012. These beaches are Agios Prokopios beach, Agia Anna beach - Maragas and Saint George Beach. With 394 awarded sea shores in total, Greece is again in the second place among 48 countries worldwide .